Welcome to Ayres Rock Campsite - We now have Camping Pods. 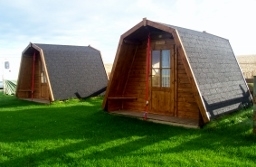 These wooden huts known as camping pods are a convenient alternative to the tent yet still retain all the ambiance of the camping holiday. Its like camping but no need to put up a tent the Pods have fully insulated walls and floor with double glazed window. We have three pods available all have the option of electric and heating you can have 1 or 2 single beds Or if you wish you can bring your own inflatable double bed. Bedding can be supplied on request and a campers kitchen, lounge available. 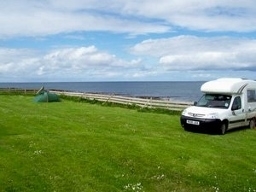 Caravans and Motor Homes - Caravans and motor homes are welcome on grassed pitches. The campsite is open all year. Special rates for block bookings. October is when Grey seals give birth to their milky white pups . The pups remain on land to suckle for 18-21 days to put on fat for the cold winter at sea.